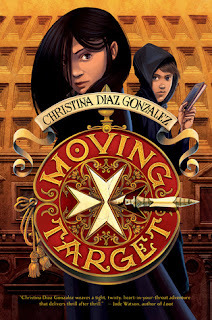 As I read Moving Target a month ago, I kept having flashbacks to another middle grade novel I had read awhile back. 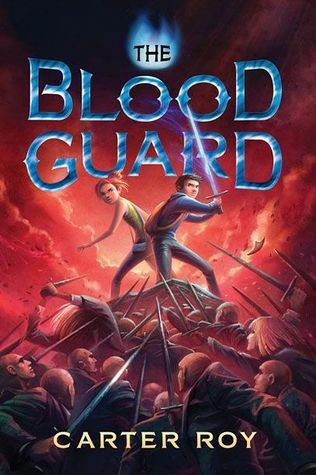 I finally looked it up on Goodreads--it was Blood Guard, and I read it about a year and a half ago. 1--Normal kid gets snatched from school by strangely desperate, fast-driving parent. High-speed chase ensues with all kinds of world-rocking information given to kid at the same time. 2--Ancient orders or groups dedicated to protecting--or wiping out--a special object or group of people. Parents belonged to one of the orders. 3--Kids left on their own to deal with the bad guys, find the object/answers, and survive. 4--Action-packed plot with lots of fighting, daring escapes, and chases. 5--Main character picks up 2 side-kicks along the way; one boy and one girl. They each get along best with the friend of their same gender. There may be even more similarities, but that's all I can remember at this point. So, if your child has read one and liked it, give them the other! Best of all, both have at least one more book in the series to read after the first. 3 stars: Fast-paced and exciting, with a few twists at the end. Cassie Aroyo is an American who goes to school in Rome, where her dad is an art history professor. One moment she thinks all she has to worry about is which teachers are giving her a hard time, when her dad hustles her off campus and begans telling her a fantastic, utterly unbelievable story--while dodging bullets and driving like a maniac. There's a magical-sounding object "The Spear of Destiny," there are groups who have dedicated their lives to finding and controlling the Spear. Then there's Cassie herself--one of a very select group of people who were born with the birthmark meaning that they--she--will be able to control the future if she ever touches the Spear. Pretty heady stuff. Before long, Dad is out of commission, and she must follow clues and find the Spear on her own. Well, actually, she has the help of a really good friend and this--other guy, too. She finds out all too soon that it's not safe to go home. Actually, nothing is really "safe" anymore. She must get the sword before the Hastati get her! Rescuing her Dad would be a good thing, too. This was enjoyable, even though I clearly not the target audience. Somewhat predictable, plot-wise, but not so much that it ruined the story for me. Lots of high-speed chasing, bullets and explosions, last-minute escapes, etc. The sequel is actually supposed to come out TODAY (September 27!) So hey, if you hurry, you can read this one, order the sequel, and be completely satisfied by the end of the week! As far as I know, there are just the two. Content: Action-related intensity, as mentioned above. Ages 10+. The lead-in was great and brought me right along: boy going about his normal school life gets picked up by his Mom, who seems in a big hurry. Before he knows it, he is informed that 1) his dad is missing, presumed kidnapped, 2) his mom is leaving to find him, 3) their lives are in mortal danger! and 4) she is a member of an order called The Blood Guard (bet you didn't see that one coming, did you?) Also, 4a) his mom knows some crazy stunt-driving moves and can wield a cutlass like no-one he's ever seen before, and 5) trust no-one. Before he knows it Ronan's dodging bad guys (and yes, fighting them too), along with Greta, a girl from his old school, and Jack, who eats as much 4 or 5 people and also happens to be very good at defending them all. Content: Fight scenes, chases, etc., but done age appropriately. For ages 10+. Have you ever experienced this type of readers' deja vu? There were obviously some significant differences as well, but I was amazed by the similarities I found once I started looking for them! You have fantastically summed up this novel to give your readers a clear idea that what this novel is all about. Bravo for you! Keep it up.